Wurstkuche (pronounced verst-koo-shah) is one of my favorite restaurants in all of LA. 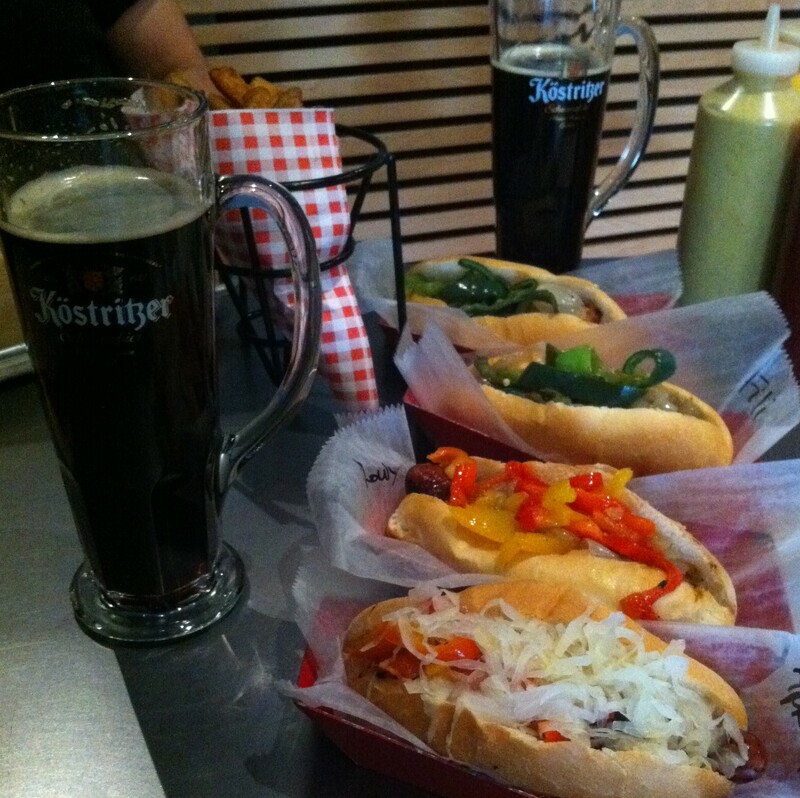 It’s basically gourmet sausages and great beer in one of the coolest spaces in the city. Here’s how it works: you place your order at a counter for one or more of their awesome homemade sausages. My favorites are the spicy and buttery Rattlesnake & Rabbit, the sweet and spicy Mango Jalapeno, the sweet Apricot & Ginger and the juicy Duck & Bacon. They have 21 different kinds of sausages including several vegan, chicken and turkey options. Next you pick two of the following toppings for each sausage: carmelized onions, sauteed hot peppers, sauteed sweet peppers or saurkraut. 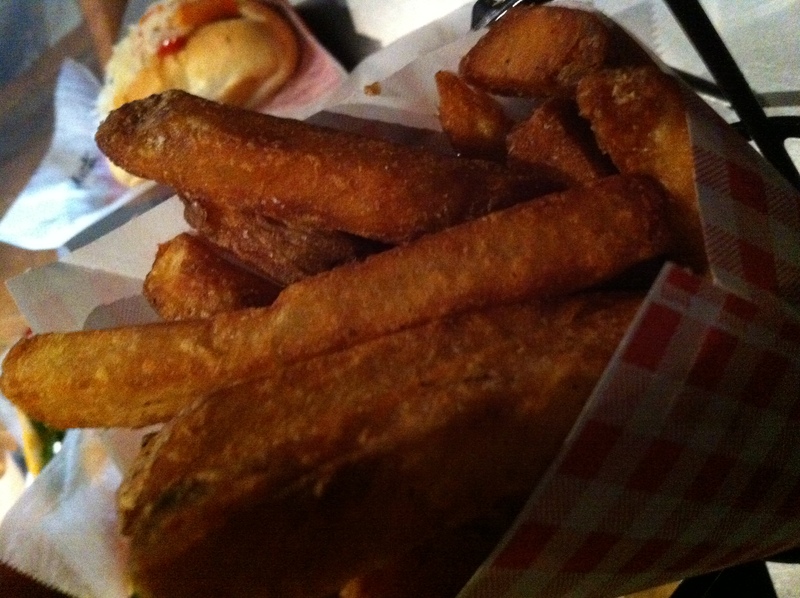 Don’t forget the Belgian fries (and make sure you order them doused in truffle oil!) plus your choice of one of their ten dipping sauces (I recommend either the Curry Ketchup, the Chipotle Aioli or the Bleu Cheese Walnut & Bacon). Then you select your drink from dozens of mostly Belgian and German draft beers, each served in a special beer-specific glass. I love dark beer and there are many nice ones to choose from here. 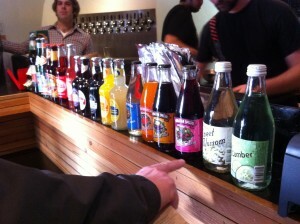 They also have a great selection of unusual sodas including Cucumber Soda, Ginger Beer and Elderflower Soda. After you’ve ordered, they will give you a number to take to the adjoining dining room, which is one of the coolest restaurant spaces in the whole city; it’s brick and industrial; a modern indoor German Biergarten. It’s also in a really interesting and beautiful part of downtown, the historic Arts District, very close to Little Tokyo and the Toy District. Once you’ve found a place to sit in the bustling dining room, start collecting your mustards, which are scattered around the room. They have five different varieties: Whole Grain, Dijon, Spicy Brown, Honey Mustard and American Yellow. Before long, they will bring you your food. Enjoy, meine Freunde! It’s like celebrating Oktoberfest (with a cool LA gourmet twist) all year long! 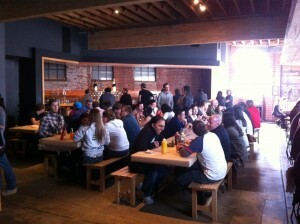 Wurstkuche is located at 800 E. 3rd Street in Los Angeles (Downtown). They are opening a second location soon in Venice. UPDATE (November 20, 2011): Westsiders rejoice! Wurstkuche has opened a second location in Venice (at 623 Lincoln Blvd; see map below) and it’s just like the downtown location. The Belgian Fries are awesome! Get them with Truffle Oil. It's a modern German Biergarten! This looks delicious! And there’s a toy district in LA!? Very excited to start exploring. Thanks Howard. on my way to this today for sure. Deciding to take the kids for a late lunch. Where to go, hmmmmm. Howard will know. He always knows. Can’t wait to try the sausages.